Apropos of the previous post about migration to Europe, if you are interested in seeing an excellent recent film on the topic, then check out Mediterranea. It is tough (as it should be) but it gives you an insight not only into the horrifying journey across the sea, but also what happens when you get there. The protagonist in the film is from Burkina Faso, but the movie starts in Algeria and ends in a town at the southern tip of Italy. This is fiction, but some of it is based on actual accounts. But more than that, it lets you imagine the complex interactions between migrants (in this case, these are economic migrants rather than war refugees - though often those two are linked together) and the local population. 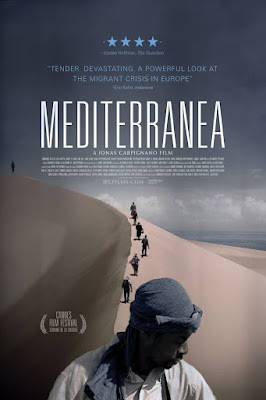 This film came out in 2015 - and truly - this is what movies should be about: Enriching our understanding of unbelievably complex situations and enhancing our compassion towards those who are affected, and doing all that in an entertaining manner. The movie starts in Algeria and ends in a town at the southern tip of Italy.